This little bird helps the people of Pala to be in the moment. In his final novel, Island, Aldous Huxley wrote about the adventures of a shipwrecked Englishman on Pala, an imaginary island somewhere in the Pacific Ocean. The society on this island had evolved to the point where there was universal economic and social well-being and a high level of respect for individual rights and freedoms. Moreover, individuals were given every opportunity to develop emotionally and spiritually. 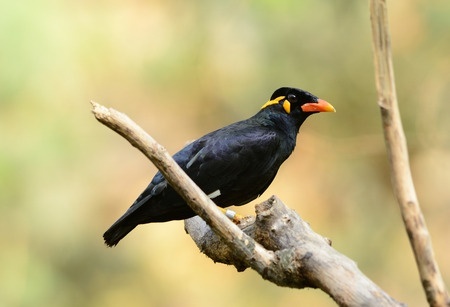 One of the many unusual features of Pala are specially trained birds – mynah birds – whose sole function is to loudly screech out “Here and now! Here and now!” at random intervals. Huxley had studied many systems of personal development during his life, including the Alexander Technique. He met F. Matthias Alexander, the developer of the Technique in London in the mid-1930’s. He was already an established author, best known for his 1930 novel, Brave New World. But his poor physical state threatened to end his writing career. Huxley was very tall and awkward and subject to fatigue, insomnia and a weak stomach. He was deathly afraid to speak in public. By the time he met Alexander, he was virtually bed-ridden, reduced to writing lying down with his typewriter resting on his chest. The lessons he had from Alexander enabled him to resume his normal activities and live in good health for another quarter century. He was so impressed with Alexander’s work that he referred to it several times in his later writings and even made Alexander a character in one of his novels. I believe the mynah birds of Island were inspired by his work with the Alexander Technique. Alexander teachers help people recognize and change harmful tension habits. This requires being present – not mentally wandering off into the past or the future. For an Alexander Teacher, helping students be consciously aware of themselves in the moment is a crucially important first step in their learning process. And not always an easy one. We are bombarded with external tasks and distractions that draw our attention away from our own mental and physical state. More often than not, our work requires an outward focusing of attention on specific tasks, projects and co-workers. Our leisure time, too, is frequently spent on activities like driving, shopping, and texting – all of which tend to pull our attention away from ourselves. On Pala, the mynah birds are whimsical devices to help bring people back to the present moment – which is really the only place we can make constructive changes in our lives. Many spiritual teachers have stressed the importance of self-awareness – Ram Dass even titled one of his books Be Here Now! – a title I’ve appropriated for this blog. The Alexander Technique is a very powerful and practical method to learn to be present in yourself, even while engaged in your daily activities. Indeed, the primary focus of the Technique is the way one carries out the ordinary activities of life. In a sense, Alexander Technique teaching supplies you with your own personal “mynah bird”, bringing you gently back in touch with yourself. Glad you like it Christine. Having read “Island” by Huxley so long ago, I had forgotten it was mynah birds and not parrots. We have a proliferation of them where I live in Hawaii. So I am guessing, if I made a recording of anyone’s voice saying, “Attention! Here and Now!” …the local birds would pick up on it and repeat it unexpectedly, just like the birds did in Huxley’s novel. A fine project, just the sort of thing I’d really enjoy doing! There’s a nest of mynah birds nearby that I can try this on. Oh, now I can’t wait to actually do this! Fascinating project! Let me know how it turns out.